Sources confirm that Neil Simon died early this morning, Sunday, August 26, 2018. He was 91, and had reportedly been suffering from Alzheimer's disease for several years. After getting his start writing for Sid Caesar's TV show in 1950s, Simon's first Broadway hit was COME BLOW YOUR HORN, followed by a remarkable string of stage hits, which were also adapted to film. Among them: BAREFOOT IN THE PARK, THE ODD COUPLE, THE SUNSHINE BOYS, BILOXI BLUES and LOST IN YONKERS. Truly sad news. Rest in peace, Mr. Simon. TCM did a spotlight of films based on his works a few years ago. I only a few minutes ago also received this sad but long in coming news. Strangely, I wager most really think he also won an *Oscar for his scripts, but nope. He was nommed (3) times only though, 1st one for the utterly marvelous THE ODD COUPLE (4 stars!) Think he lost though to the magnificent LION IN WINTER? I always thought without searching he was up for '78's CALIFORNIA SUITE though? There were 17 films shown for the Neil Simon spotlight back in January 2015. Since I was there in April 1999, for some reason a ton of celebs have selected this place? Wow. I just watched one of his stories on TCM, by now I must have most of the ones they have shown. Too bad he had to go through what he did. Rest in peace. Such a talent, he was always so funny. One of the enduring highlights of my Broadway theater-going was Matthew Broderick in "Brighton Beach Memoirs". When I went to see "Biloxi Blues", the audience could not stop laughing. RIP, Mr. Simon, your star shines brightly. I ran into him once - he was filming a scene with Marsha Mason at the New York Public Library - I was working overtime and getting a quick bite - he looked at me and smiled so sweetly - he seemed to be a genuinely likable man. Four nominations, not three: The Odd Couple, The Sunshine Boys, The Goodbye Girl, and California Suite. 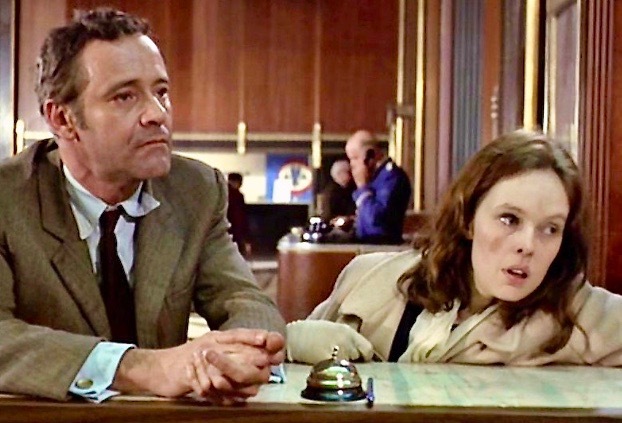 the perfect double bill to commemorate neil simon is the out-of-towners followed by the prisoner of second avenue both with jack lemmon but I expect tcm will prefer to shove the usual crap like the fortune cookie, the odd couple and the goodbye girl with dreyfuss up our kazoos. The Fortune Cookie is not crap. It's also a Billy Wilder/I.A.L. Diamond collaboration, not a Neil Simon work. The Prisoner of Second Avenue is one I didn't care for at all. I'd rather see another airing of The Sunshine Boys, along with Barefoot in the Park and Plaza Suite. I'd rather see another airing of The Sunshine Boys, along with Barefoot in the Park and Plaza Suite. THE SUNSHINE BOYS will probably be the one TCM chooses when they include Neil Simon as part of the 2018 In Memoriam programming at the end of December. He almost always does that in an obit thread. In fact, this time he was relatively nice, since usually it's "Who cares? ", "Never heard of him/her. ", or "I thought he/she was already dead." Who doesn't love this film? It's my favorite Neil Simon story. Condolences to Elaine Joyce and the entire Simon family. At least Joyce had many good years with Simon (19), unlike the tragedy with her first husband Bobby Van who died at the age of 52.
oh yeah, the fortune cookie is billy wilder. the film I found a disappointment because lemmon's horrible wife doan get her just desserts like she shoulda. the out-of-towners and the prisoner of second avenue cry out to be shown together. the first time I saw that was at the beginning of the 1970s on a cbs affiliate on a lazy Saturday afternoon. at the time seeing it listed in the pages of TV Guide the idiots were giving it believe it or not just one star meaning they thought it was poor. the old TV Guide description would say 'more harrowing than funny'. I sat thru it and loved it. Glad you saw through it. I would say it is a three-and-a-half star film (out of four stars). Woo-hoo! Elaine Joyce is single again! Oh yeah . . . R.I.P., Neil. I see Elaine fairly often on Buzzer - the network that shows 'old' game shows. E.g. she is on Tattletales with then husband Bobby Van, and Match Game (sometimes with Bobby and sometimes alone). The combination of her looks, sexiness, smile, and that Goldie type giggle, get to me every time. I'd just gone thru the "trilogy" in the last month: BRIGHTON BEACH MEMOIRS, BILOXI BLUE, BROADWAY BOUND. Sometime he was too jokey, but mostly his plays are pretty funny. THE SUNSHINE BOYS remains my favorite of his major works; THE ODD COUPLE remains my least favorite (maybe it's just too familiar). BAREFOOT IN THE PARK has just been added on Starz streaming. I had the unique pleasure of witnessing an audience's reaction to a a Neil Simon book on Broadway at the Schubert Theater during the initial run of Burt Bacharach and Hal David 's "Promises Promises" starring Jerry Orbach. "The Apartment"-- which is a plot about sexual predators in the office, attempted suicide, adultery, et al. But all in all Neil Simon made it enjoyable without cheating the dramatic aspects of the plot. And of course I will always be grateful to him for creating "The Odd Couple". Neil Simon had so much success on Broadway and was responsible so much for the success of Broadway, in the latter half of the 20th century, that he should be called " The Man Who Re-created The Great White Way".